You won’t meet a more compassionate couple about recovery than Mike and Sara Rissolo of Easton. 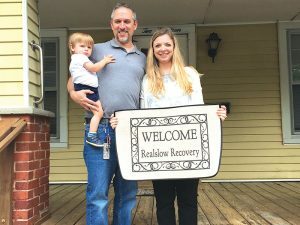 The couple took their savings and instead of investing in a larger house for themselves and their five children, chose to open The Gratitude House, a recovery house for men on Davis Avenue in Easton. Their house motto, “A grateful addict will never use,” is striking chords with 15 residents who remain clean today having lived at The Gratitude House during this past year. The community helped the couple to open the house in June 2017, donating furniture, painting rooms, and refurbishing the house. The Gratitude House opened with two residents in June and by August 2017, the house was full. It has remained full at 96 percent occupancy since then. The recommended length of stay at The Gratitude House is between six months and one year. 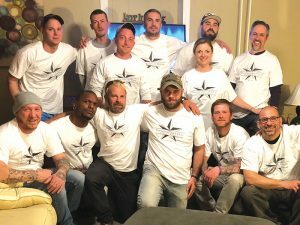 The men of The Gratitude House, along with owners Mike and Sara Rissolo, wear shirts to celebrate the first two graduates of the program. Sara recalls a nine-week period when no one left who was living at the house. When asked what makes this recovery house different, Sara points to gratitude as an important element of the recovery process. She states that in the field of positive psychology, gratitude is known for its prosocial qualities, including the development and maintenance of social relationships. According to the Rissolos, everyone needs a home base. The couple takes pride in providing parental roles for the residents. Some of the residents even call Sara “Mom.” Mike enjoys hanging out with the guys. The Rissolos are currently looking for property in Easton to open a recovery house for women to help further their goal of reuniting families affected by drug and alcohol addiction. 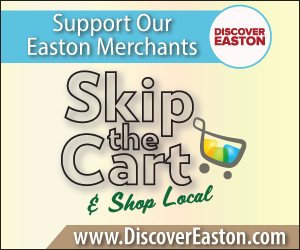 They would be willing to rent a residence and are looking for a house with four to five bedrooms within walking distance to downtown Easton. The Gratitude House is owned and operated by Realslow Recovery, LLC, a 501(c)3 non-profit. Its mission is to provide safe, affordable, and supportive housing for all people to live and grow in recovery from drugs and alcohol. The house is for men, ages 18+ and every resident is required to work at least 30 hours per week either at a job, job hunting, school, or volunteering. 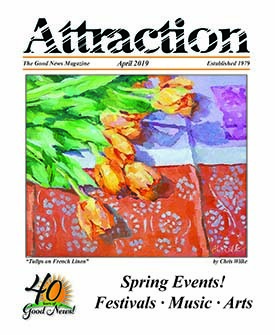 Tax-deductible donations are being accepted to The Gratitude House. In addition, the house is in need of household and personal care items, lawn and garden supplies, men’s bikes, bedding, and food items. To donate, contact Sara Rissolo at 443-618-0296 or email sara.realslow@gmail.com. Along with their youngest child, Mike and Sara Rissolo stand on the porch of The Gratitude House, a recovery house for men on Davis Avenue in Easton.